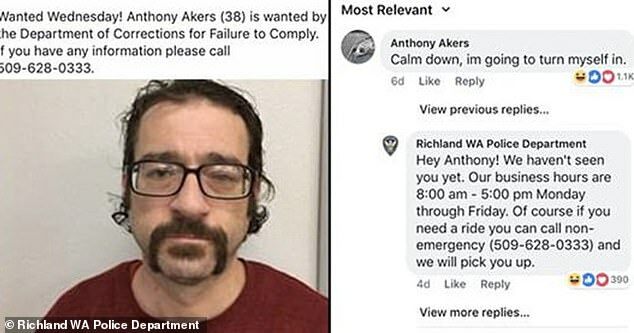 A Facebook exchange in which police and a suspect played out a mock-romance beneath the man's own 'wanted' post has gone viral after he initially commented telling them to 'calm down'. When Richland WA Police Department shared an appeal for information on a man named Anthony Akers last week, the last source they expected to come forward was the man himself. But instead 38-year-old Akers commented below the post assuring them he was going to co-operate. However, when he failed to appear after a few days, Richland PA got back in touch. They wrote: 'Hey Anthony! We haven’t seen you yet. The next two days came and went, however, and after one Facebook user inquired as to whether he had shown up, the Police confessed that he had let them down, again. Then things got weird. 'I will be there no later then lunchtime tomorrow, I know you have no reason to believe me after what i did to you, but I promise that if I don’t make it on my own by lunchtime tomorrow I will call for a ride to assist me with my commitment issues. But by Monday, Akers still had not appeared. 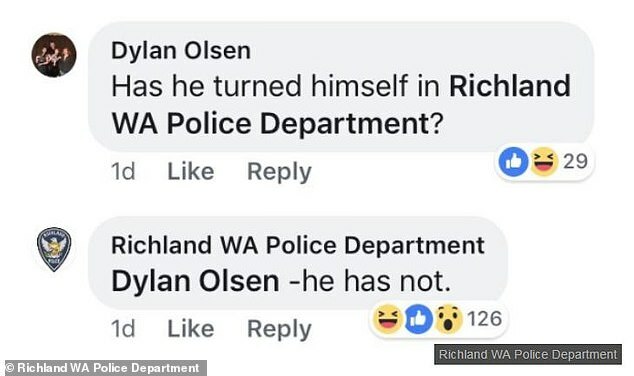 The Richland WA Police Department put out another statement, a little more melancholy than the first: 'Morose Monday. 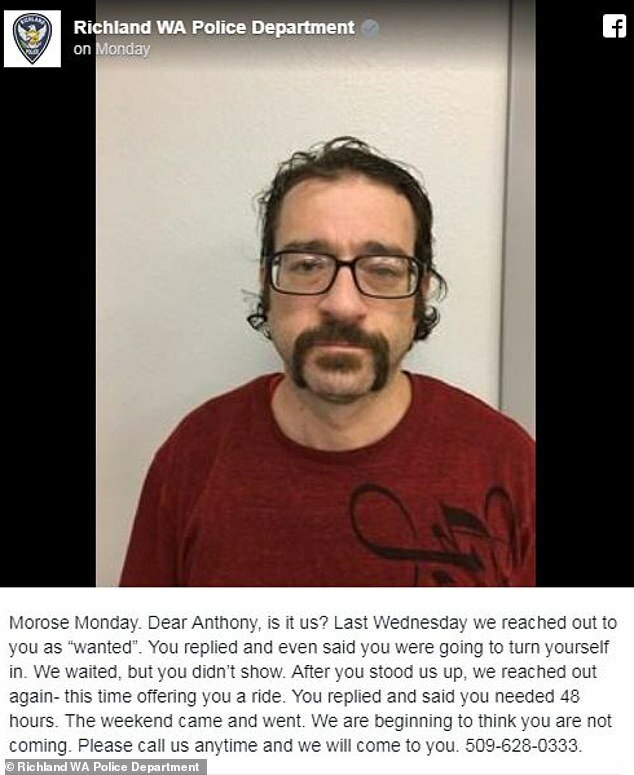 Dear Anthony, is it us? Last Wednesday we reached out to you as “wanted”. You replied and even said you were going to turn yourself in. 'We waited, but you didn’t show. After you stood us up, we reached out again- this time offering you a ride. You replied and said you needed 48 hours. Yesterday, after days of waiting and going back and forth, the police finally got their happy ending. 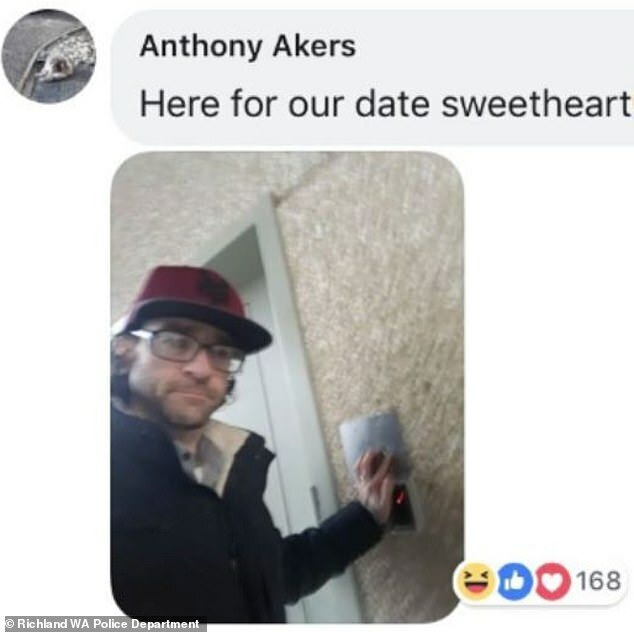 Akers even posted a photograph of himself outside the station alongside the note: 'Here for our date sweetheart'.